These are the standard seat belt swivels with mounting bracket. The mounting brackets bolt to your seat tower in place of the footman loops using the same 4 bolts that previously held the footman loops on and has 3 locations to mount the swivels on them. 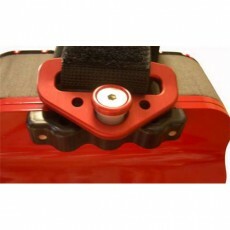 This swivel kit includes 2x belt loops, 2x swivel mounts w/ nylon bushing, 2x mounting bracket, 2 5/16" x .25" FHCS SS bolts. This swivel set will also bolt up to an older plastic air chair seat tower without modification, and a newer aluminum air chair seat tower with slight modification. Bracket mounting bolts not included, must be purchased separately if needed.